I have been super excited to get my sewing back on track and get things in order for what I believe to be the best year yet! So many stars are aligning to make super optimistic about the upcoming year! I got a new sewing machine - an old Singer Classic, and I LOVE it! SO far I have repaired or altered 12 pieces of clothing that I haven't been able to wear in YEARS! 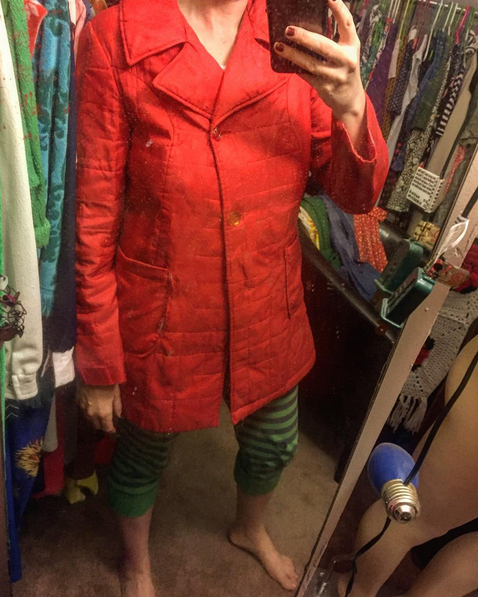 My favorite 'lucky red coat' that I was wearing when I met Christian is now able to be worn again! It's been in pieces for at least 5 years!!! I actually carried ol' 85 pound Eddie up the stairs (he is too scared to walk up the stairs himself), so he could hang with me while I worked :) Boy, do I love this fella!